Billabong Wake Tour – Win a Wakeboard! 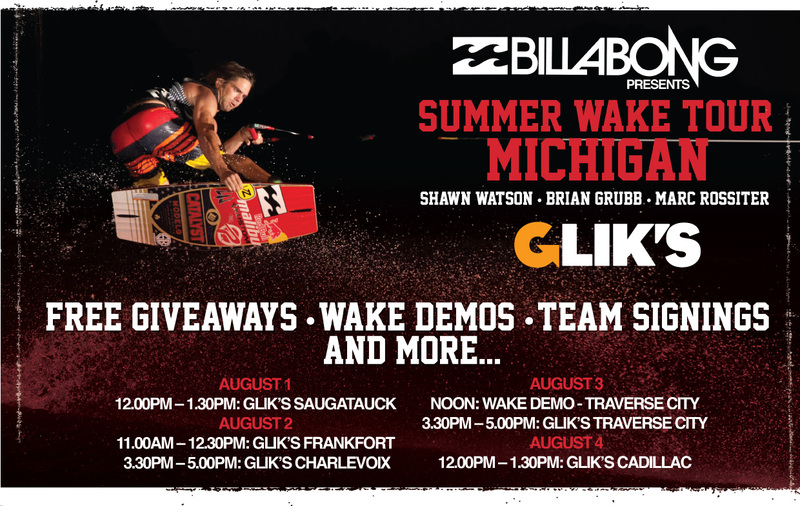 Billabong pro riders Shawn Watson, Brian Grubb and Marc Rossiter will be touring at Glik’s locations throughout Michigan this summer. See below for a list of dates and locations. At each location, there will be free giveaways, chances to meet the pros and more. In Traverse City, MI, the pros will be getting in the water for a demo at noon on August 3rd before heading to the store. Here’s your chance to win a free wakeboard from Liquid Force. The Watson Classic 142, worth around $350, is up for grabs at the Traverse City stop. Be present to register to win for the board, as well as the chance to have Shawn Watson autograph it. Winner will be chosen at random at the event in Traverse City. Can’t make it to Traverse City but want a chance to win the board? We have a second board available! All you have to do is tell us why YOU want the board. Do you love to ride? Need a new board? Want to learn how to ride? Is Shawn Watson your idol? Tell us! Convince us that you want it the most. We will decide the winner on August 1st.